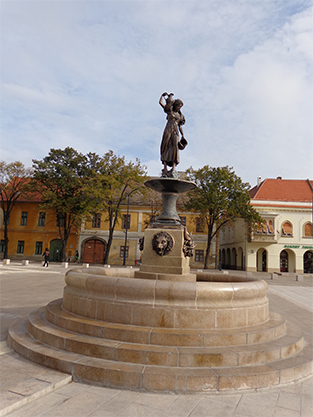 The city of Pápa is one of the most beautiful baroque cities of Hungary and is located close to Vesprém. The city’s history is closely connected to the Esterházy family. In the middle ages, Pápa was an important trade centre, later, Count Franz Esterházy allowed the settlement of Jews in the city. Two groups of Germans came to Pápa. Firstly, German soldiers who were stationed there between 1651 and 1655 in the Ottoman Wars and secondly German-speaking bourgeoisie. The matriculation books list the settlers’ vocations. In the early years, mostly artillery men and Hajduks, freedom fighters against the Ottoman Rule, came to the region. In the second generation from 1660 onwards, many different professions could be found, such as masons, carpenters, weavers, candle drawers, thrashers and even swimming pool attendants. This master generation of German craftsmen mostly came from Austria and adapted to the city life, building relations with the local bourgeoisie. In the 17th century, a third wave of German settlers came to the lower city of Pápa. At that time, Pápa became an important centre of industry and trade in western Transdanubia. The Esterházy family supported the establishment of guilds, especially the guild of masons, of stone masons and of slaters, the members of which mostly were German settlers. Pápa had close mercantile ties to Vienna, Graz, Salzburg and Bratislava. In 1786, Carl Friedrich Kluge from Silesia established a dyer’s factory, which today is a museum. It is one of the oldest factories in central Europe and is listed as a protected monument. Although it was closed in 1956, its interiors are well preserved and still function today. The city’s palace, which was built for the Esterházy family by József Grossmann instead of a medieval castle, today holds the local history museum. 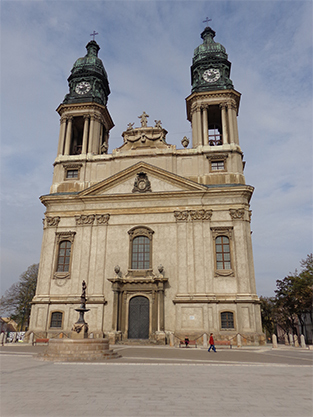 The church of Saint Stephan with its two towers was built in baroque style.